Kindness and simplicity worked for Snowman. Shown here with Harry de Leyer aboard. When Dutch immigrant and horseman Harry de Leyer bought a mud and manure covered plow horse in the winter of 1956, little did he know he had just hitched his wagon to a star. Within two years he and this equine diamond in the rough would jump beyond their wildest dreams and become the darlings of America and beyond. This is the true Cinderella story of Snowman. The non-descript grey horse’s first eight years of life were spent pulling a plow and he eventually ended up at an auction in Pennsylvania to go to a buyer if lucky and to the slaughterhouse if unlucky. Horseman Harry de Leyer was a riding instructor from a small riding school and he wanted a quiet equine schoolmaster for his nervous students. By the time he got to the auction in his old station wagon, the sale was over and the unsold horses were in the knacker’s truck going to their final destination. De Leyer didn’t want to go home empty handed so he had a look at the horses inside the truck. The truck dropped off the unloved, underfed horse at de Leyer’s farm and when his daughter saw the grey horse in the winter snow fall, she said he looked like a snowman. One of the world’s future champions now had a name and nobody knew that this $80 horse was about to change countless lives and become a much loved American icon of determination and spirit. Snowman’s talents were not recognized outright and de Leyer actually sold the horse to a neighbour, a doctor for $160, who wanted a quiet horse for himself and his children. Three days later Snowman was back in de Leyer’s paddock and he advised the doctor to build his fences higher and tie a tire to the horse so that he couldn’t jump. Three days later Snowman was again back in de Leyer’s paddock complete with tire. The doctor asked him to board the horse, but never came to see him so in the end Snowman once again became de Leyer’s horse for the price of past board. Snowman had made it clear that he could jump the moon and would tackle six foot jumps to get back to de Leyer, the man he wanted to be with. Eight years after arriving in the USA, and two years after first buying the grey horse, de Leyer and Snowman made their mark. 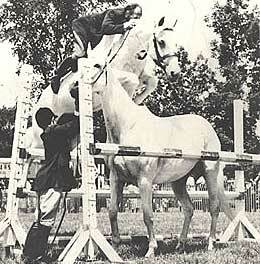 During his five-year career, Snowman won the most prestigious jumping competitions in the nation. Among his many accomplishments was winning the National Horse Show Open Jumper Championship in 1958, and being named the American Horse Shows Association Horse of the Year in 1958 and 1959 and the Professional Horsemen’s Association Champion. 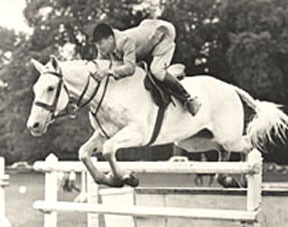 In 1992, Snowman was inducted into the Show Jumping Hall of Fame. Snowman was a child’s best friend. Snowman, like Canada’s famous Big Ben, loved children. 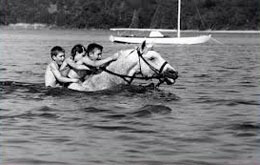 De Leyer says that Snowman would often jump out of his paddock just in time to meet the school bus, swim with a gaggle of children on his back or stand patiently while six youngsters balanced on top of him. But, the next day he might compete at a horse show where the likes of Frank Chapot, George Morris and William Steinkraus were in attendance. At the onset there were more than a few laughs from the audience as little known Harry de Leyer came into the ring on his common grey horse. However, the Flying Dutchman and his former plow horse had the last laugh and beat them all. The American public loved them! Snowman made appearances on The Tonight Show with Johnny Carson, had a fan club, was flown to guest appearances, was featured in LIFE magazine and busloads of children would arrive at the farm to have their photos taken with him. In an era when professional sports teams did not exist to the extent that they do today, the Cinderella story of Snowman grabbed the public attention and he became an icon that boosted moral in the Cold War Era. Snowman died at the age of 26 in 1974 and is buried at de Leyer’s former farm on Long Island, N.Y.
A look at the old film footage and some still photos of Snowman and de Leyer gives us a peak at the world of show jumping from a bygone and simpler era. Check it out here. Snowman is the subject of the book, Eighty Dollar Champion: Snowman, the Horse That Inspired a Nation by Elizabeth Letts, published by Random House in 2011. HARRY AND SNOWMAN played for limited run in select Australian cinemas starting May 19, 2016. It is now available it its entirety on YouTube Movies where it was published on Oct 28, 2016. Dutch immigrant Harry deLeyer journeyed to the United States after World War II and developed a transformative relationship with a broken down Amish plow horse he rescued off a slaughter truck bound for the glue factory. Harry paid eighty dollars for the horse and named him Snowman. In less than two years, Harry & Snowman went on to win the triple crown of show jumping, beating the nation’s blue bloods. They became famous and traveled around the world together. Their chance meeting at a Pennsylvania horse auction saved them both and crafted a friendship that lasted a lifetime. Eighty-six year old Harry tells their Cinderella love story firsthand, as he continues to train on today’s show jumping circuit. Thanks for the kind comment. I loved this story because Harry kept this horse as his own and didn’t sell him no matter how much he was offered. I wonder how many world champions are standing in field or paddocks as I write! It takes a twist of fate to find them! Wonderful story—so refreshing to read a story like this. The nicest part of this story is that Harry hung onto this wonderful horse and no matter the money he was offered he wanted to keep him for a lifetime. I grew up with the story of Snowman. One of my ultimate favorite. I had every book, article and yes, at one time the Breyer horse statue of Snowman! A story that should be told over and over, for all generations! When will the DVD be available in Canada?